Nissan has revealed an all new Nissan Navara Concept in Germany which is aimed at the astronomer market, and we have to say, it's very beautiful! 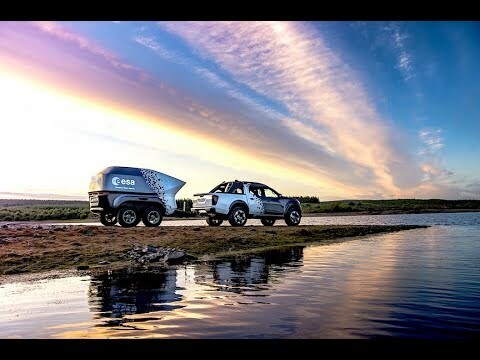 Teaming up with The ESA (European Space Agency), Nissan have give the Navara a new image, one from outer-space. Designed to take astronomers to remote locations for star gazing, the Navara is packed with technology and safety equipment to take you there safely featuring Nissans semi-autonomous Pro-pilot system, enhanced blind spot warnings and around view monitors to keep this spectacular vehicle from inheriting any dint's and scratches. Struggle hooking up trailers? No problem. With the advanced features this vehicle beholds comes a system that actually helps you align the vehicle to the trailer before takeoff called 'Intelligent Towing Hitch Alignment'. It takes control of the steering, acceleration and braking of the vehicle to help you in your time of need. You can't be going to remote locations and not stay in-touch with friends and family, right? The Navara Dark Sky has the solution to that with having built in WI-FI which keeps you connected even in the most remote locations, and if you ever need some entertainment, make use of the vehicles television signal transmitter to keep you entertained on those long expeditions to nowhere. Inside, the vehicles interior lighting has been replaced with a gorgeous fiery red, as red affects the night vision of humans the least. Stunning reflective trim has been used on essential parts of the vehicles interior to aid access in low light, without the need for a torch or any other light forms. As you will see from the images, the Navara Dark Sky comes with a trailer which transports all the equipment including a telescope, Planewave telescope and other astronomical gear which is all safely housed within the trailer, and that also contains a protective mechanised roof to complete the security of the equipment. A battery placed in both the vehicle and the trailer will cater for the additional electrical needs of the pair instead of relying completely on the vehicles battery. The power of the additional battery doesn't end with powering just the trailer and vehicle, the addition of this extra electricity will allow laptops and other scientific gadgets to be used inside the vehicle which will not drain the Navara's battery. The Navara's 2.3L diesel powertrain remains unchanged on the Dark Sky Concept, with an energetic 187BHP on tap. The only real difference to the vehicle mechanically to the car is that it has been been raised 140mm in ride height, allowing better off-road ability. Large off-road wheels with knobbly tyres – 20" on the Navara and 16" on the trailer help with the overall ride and stability of this futuristic convoy.